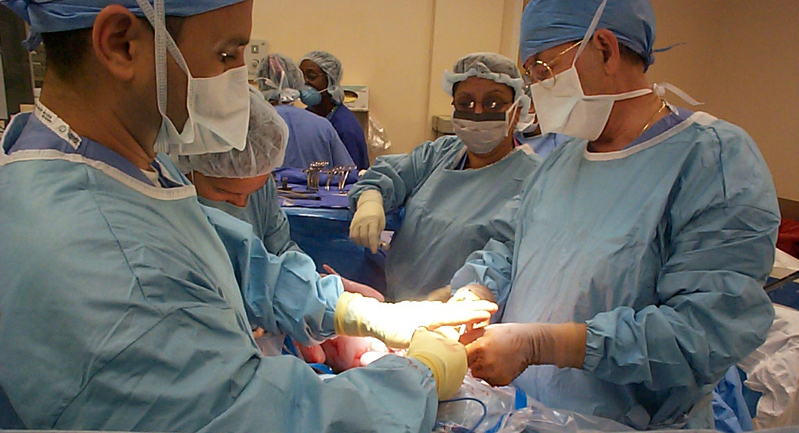 Total knee replacement operations are the most popular elective surgical procedure in the U.S. There are over 600,000 performed each year. While this is an incredible number, the next most popular elective surgical procedure is the total hip replacement. These involve more than 300,000 operations annually. That figure is expected to grow in the years to come at a high rate. One of the reasons we are seeing more operations is because younger patients are more willing to have a total joint replacement because they are tired of chronic pain and the surgery. More importantly, the recovery time is much better and easier to deal with than it was in years past. A major reason for that is because of advances in technology. These days, surgeons dress in full body protective suits and operate robots that are assisted by computers to perform the total hip replacement sugary. This allows the operation to go smoother, be less invasive, and have a much shorter recovery and rehabilitation process. This means people can get the operation and go back to work sooner. A recent news article from WCAX, looks at some of the new technology being used at NYU Langone Medical Center to perform total hip replacement operations. One thing that allows for this technology is better understanding about how the body works and how the hip works. While humans have been studying anatomy in some form or another for thousands of years, it is computers and imaging equipment that really allows this to be accomplished. As discussed in the article, doctors found out how important the spine is to the hip. They now understand that it is the spine that controls the movement of the hip and how the artificial joint will function. On the other hand, the new joint will affect how the spine functions following the operation, so understanding of the relationship is crucial to the entire process. Surgeons will now create physical model of the hip using 3D printers and other technology to understand exactly how a patient’s joint works and how it will interact with spine. This allows them to better fit the implant. However, as our Boston defective artificial hip lawyers can explain, all this technology will not make up for a defectively designed hip. There have been many cases of defective artificial hips over the years, and one of the biggest offenders is known as the ASR or Pinnacle artificial hip manufactured by a medical device company known as DePuy. This is a major manufacturer of artificial hips. This problem with this line of artificial hips is that it was designed with a metal-on-metal joint. This was a bad idea, as metal rubbing against metal generates friction, and that leads to device failure. It also leads to shards of metal entering the patient’s bloodstream, and that can lead to a form of poisoning called metalosis. The reason they made this type of hip was because they marketed it as being smoother and better for more active patients. This was the opposite of what actually happened.